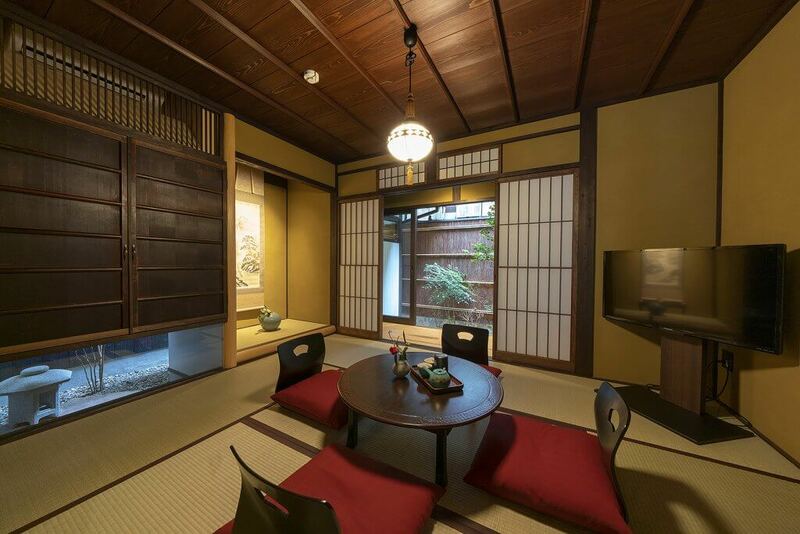 The design of the Kyoto machiya is steeped in tradition- from the white lattice windows to the clay tiled roofs and protruding wooden lattice windows. 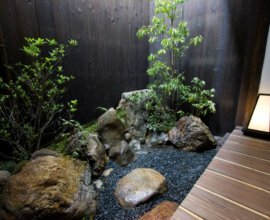 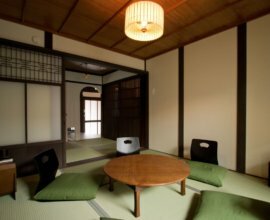 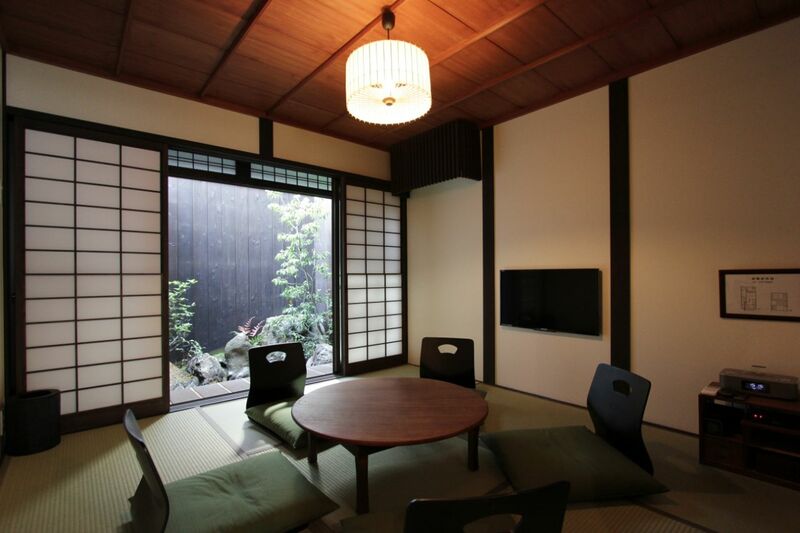 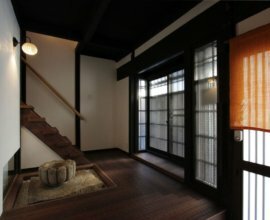 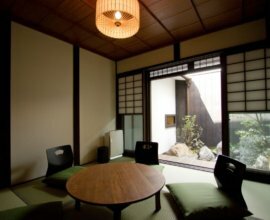 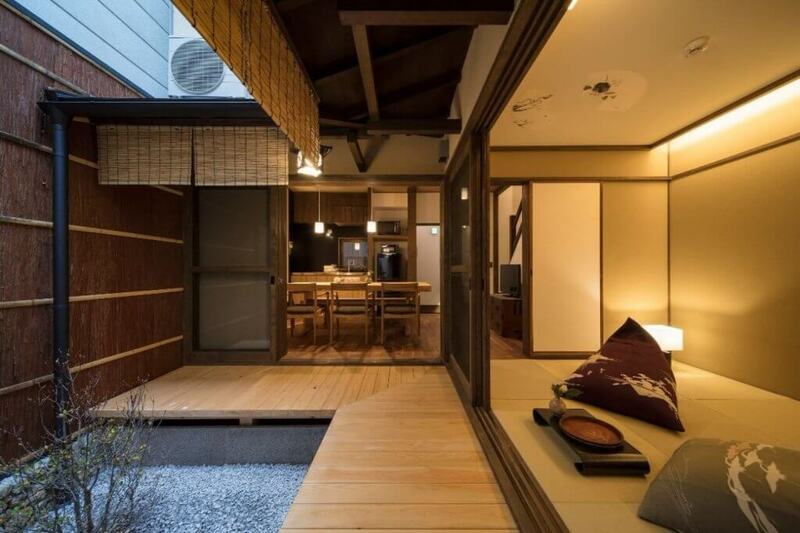 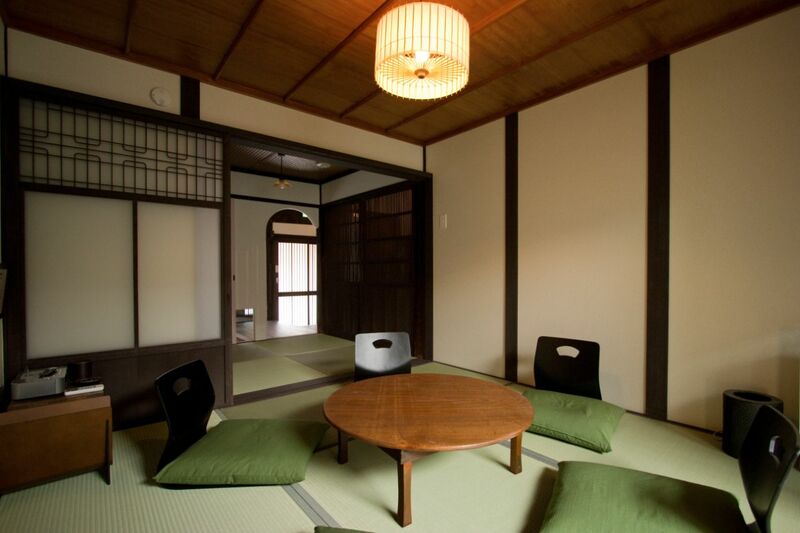 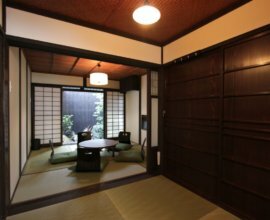 “Anzu-an” machiya house sits quietly on a small street. 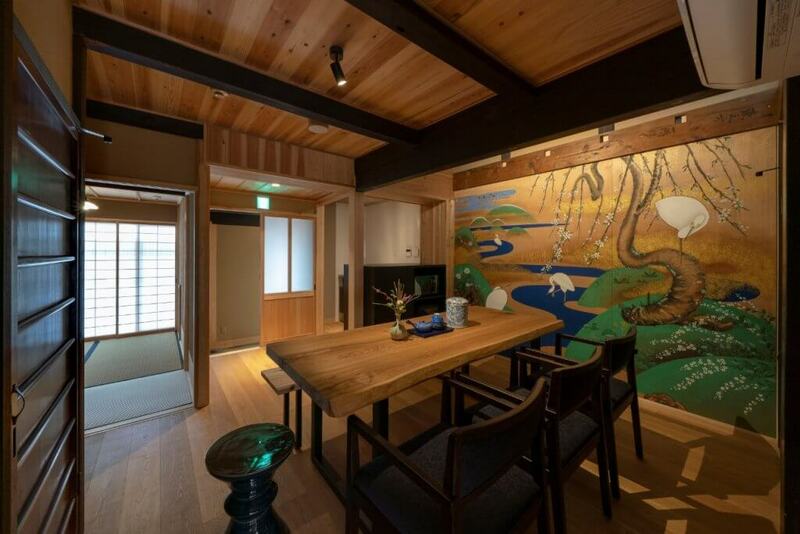 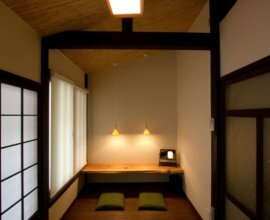 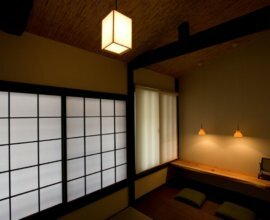 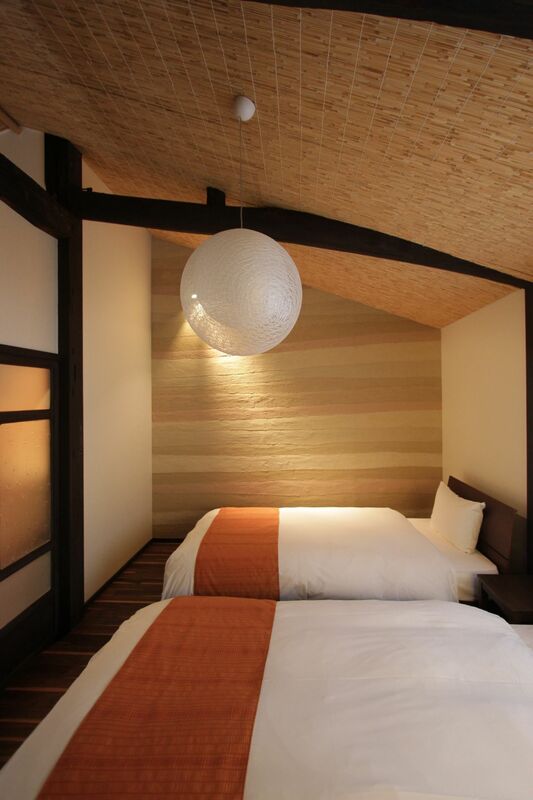 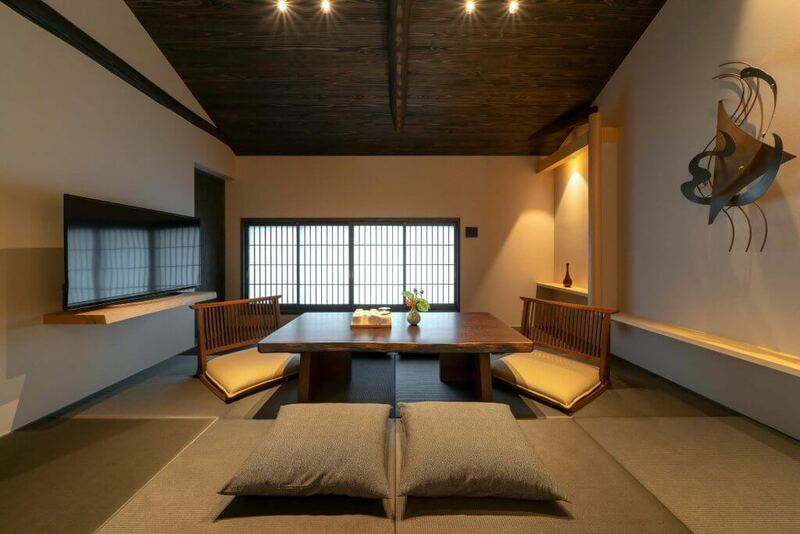 This bright and cozy machiya will welcome you into a house fitted with dark mahogany wood, traditional tatami mats, and calming white walls. 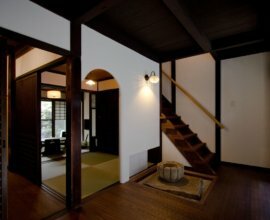 Each room of this house has been meticulously designed with incredible detail, and unique features– from the traditional tearoom inspired entranceway, to the blue-green stones featured in the bathroom. 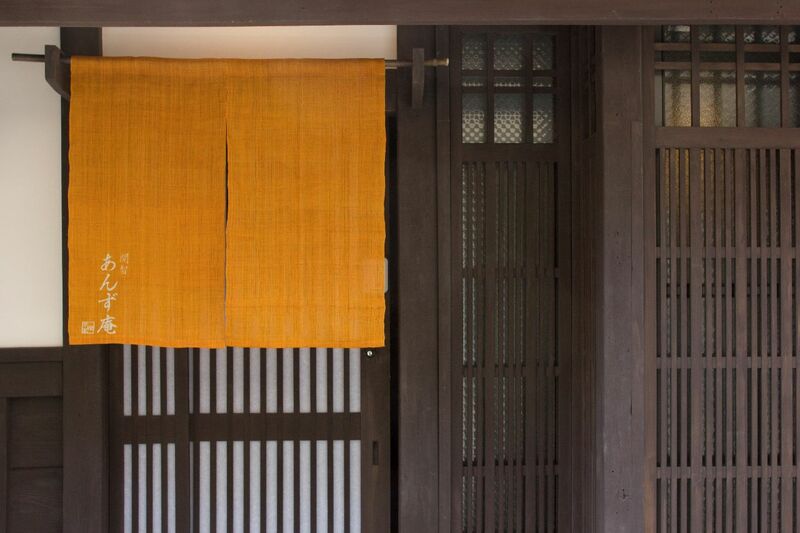 With the adept use of shadow and light, the design of this machiya embodies the ancient Japanese sense of beauty. 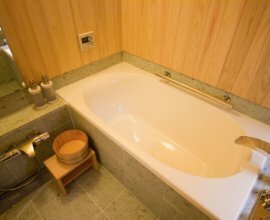 Enter to discover tranquility From the gently sculpted wooden floors to the stone basin, discover traditional details that evoke serenity. 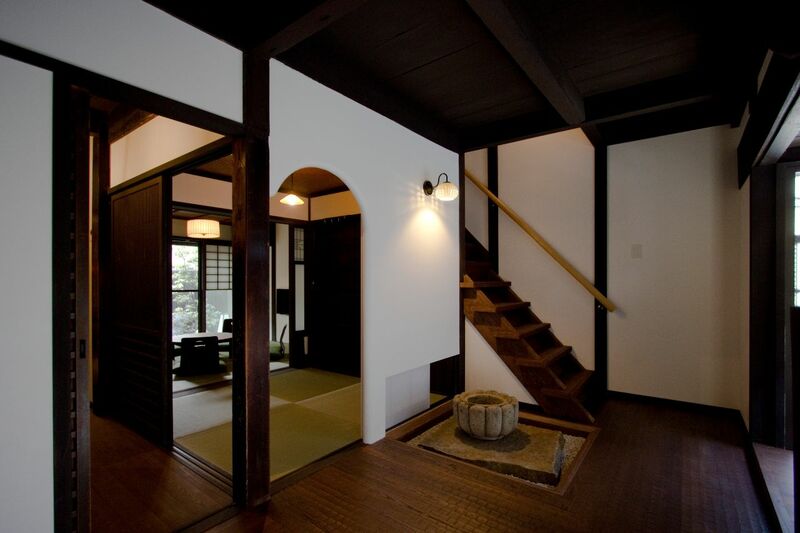 Through the curved entrance way, find an intricate wooden woven ceiling. 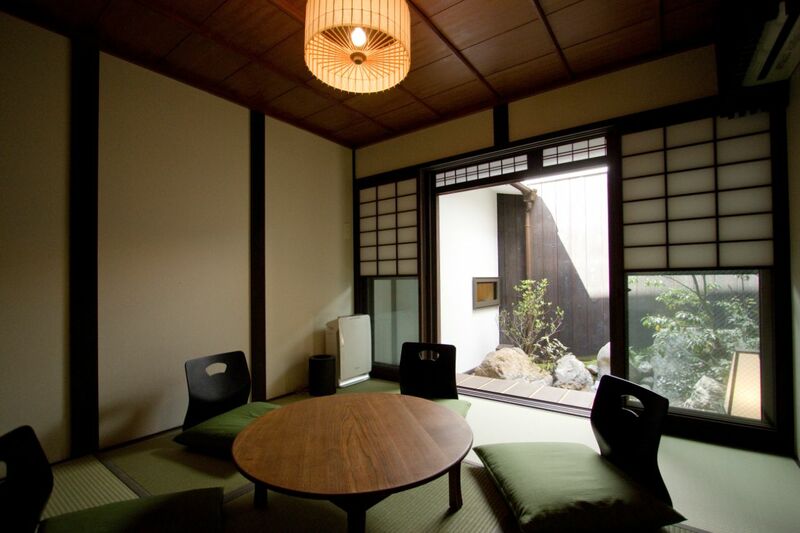 Living room with garden Slide open the 'shoji' paper sliding doors to enjoy the fresh ‘tsuboniwa’ garden from the traditional living room or from the veranda. 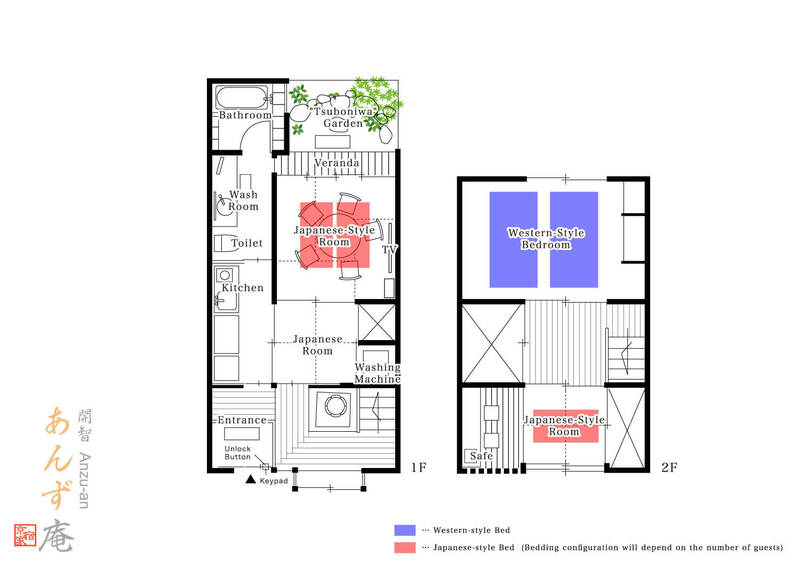 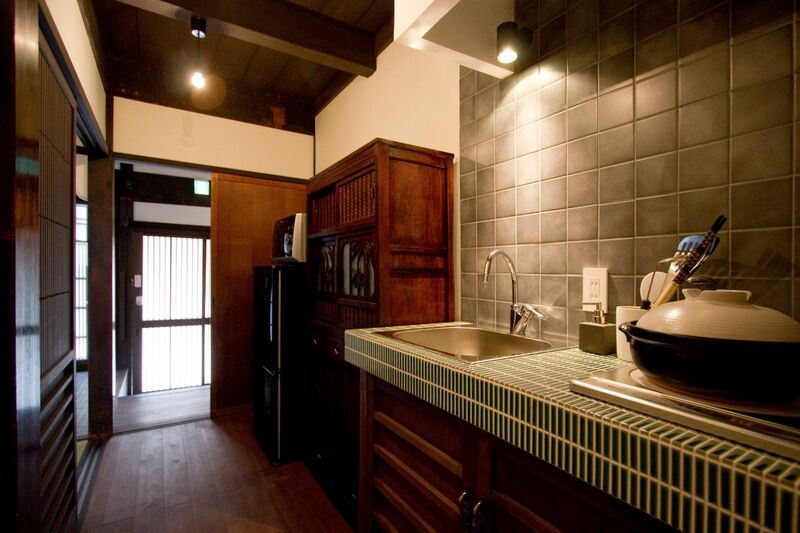 Kitchen A fully equipped kitchen where you will be free to cook light meals during your stay. 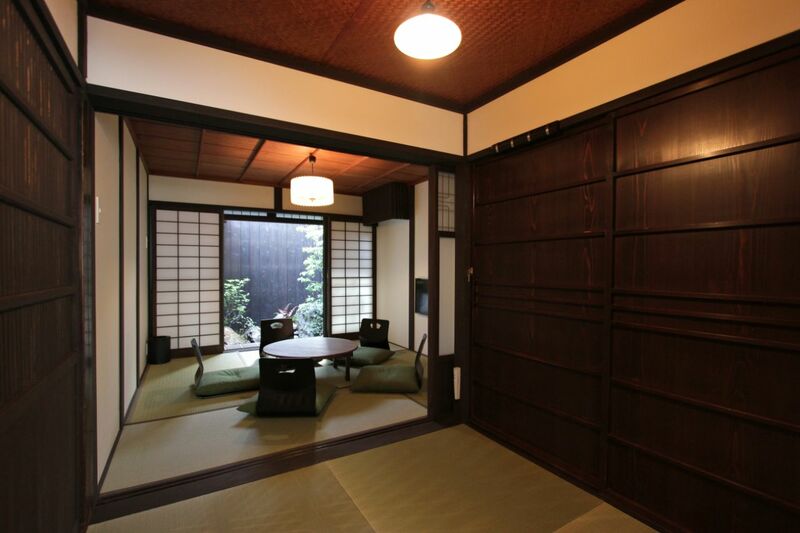 Inside the antique cupboard are traditional plates and utensils and daily-use kitchen appliances. 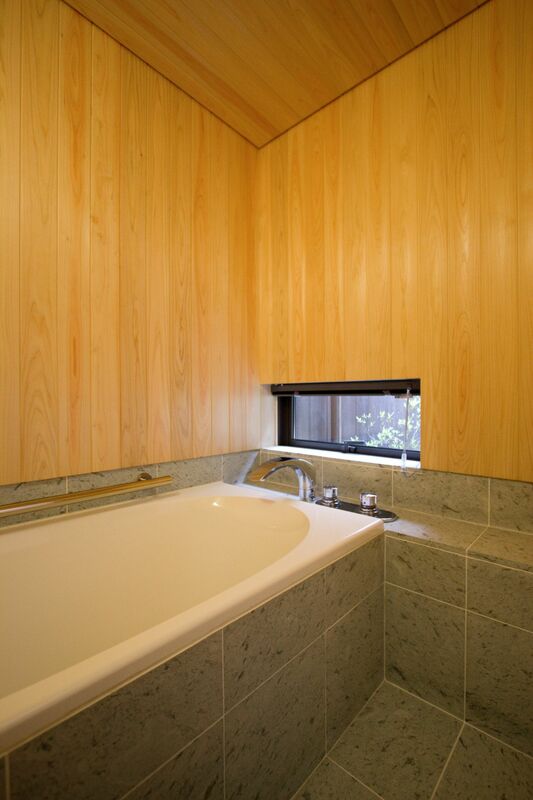 Bathroom A beautiful bathroom lined with fragrant wood and special ‘towadaishi’ blue-green tiles awaits. 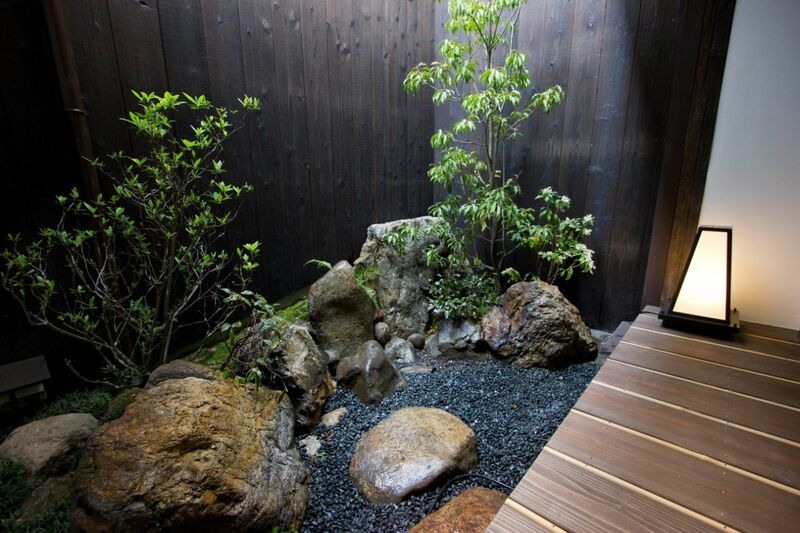 Unwind with a view of your private garden. 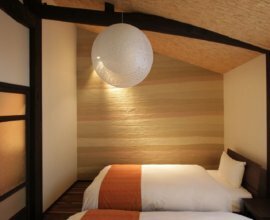 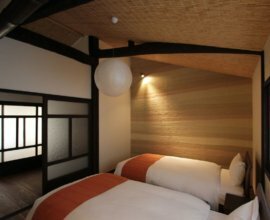 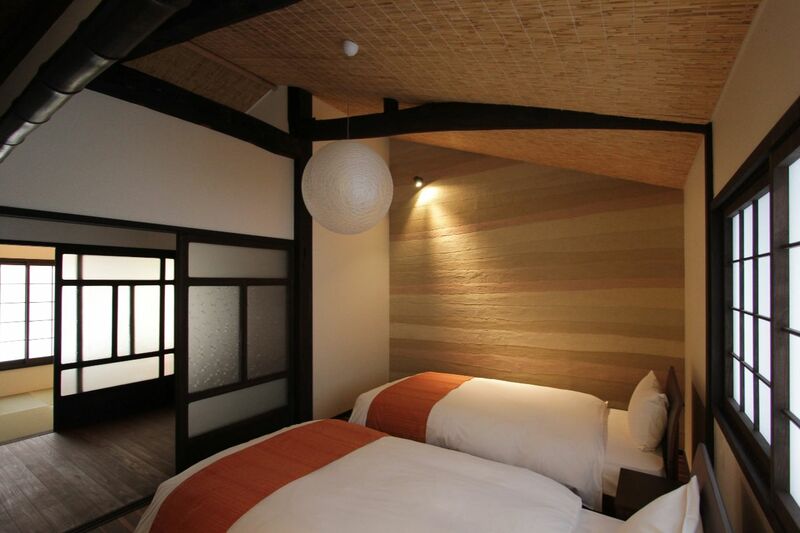 Western-style bedroom With exposed wooden beams, a bamboo reed ceiling and earthen walls, relax in this traditional bedroom. 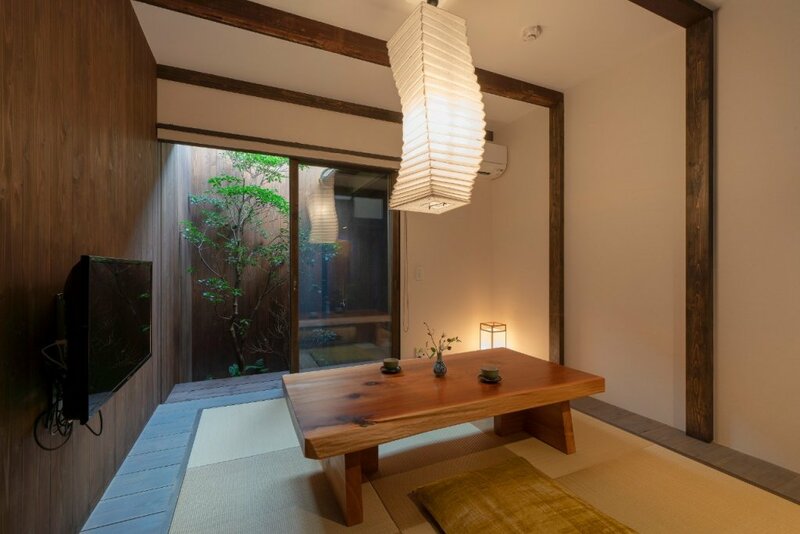 A round lantern provides a warm ambiance. 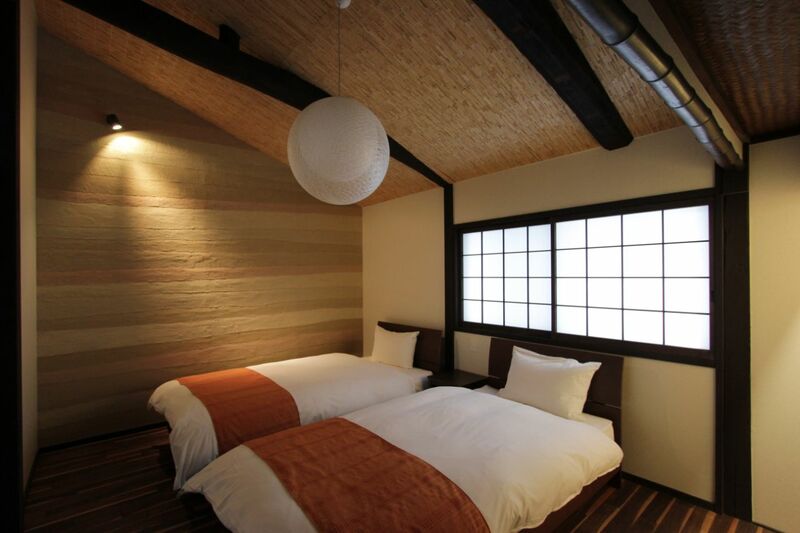 Japanese-style bedroom The large window of this room, called a 'mushikomado', provides plenty of natural light to illuminate this Japanese bedroom. 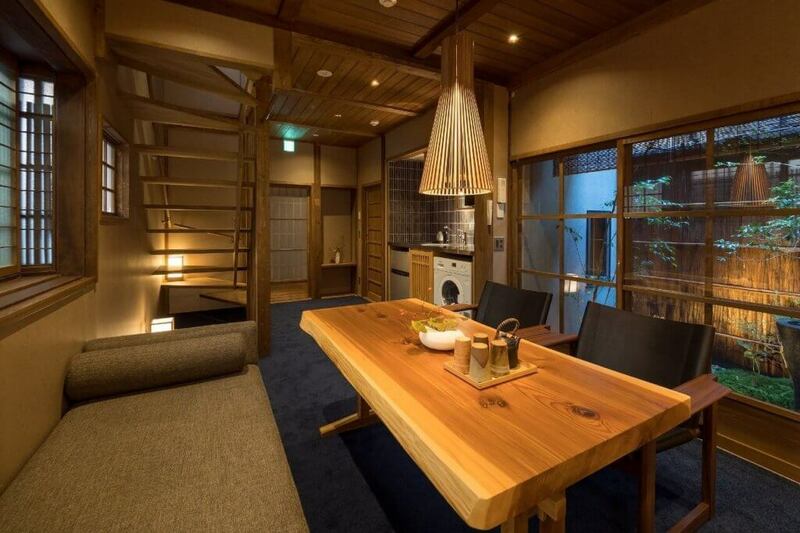 A wooden table is the perfect place to get ready for the day. 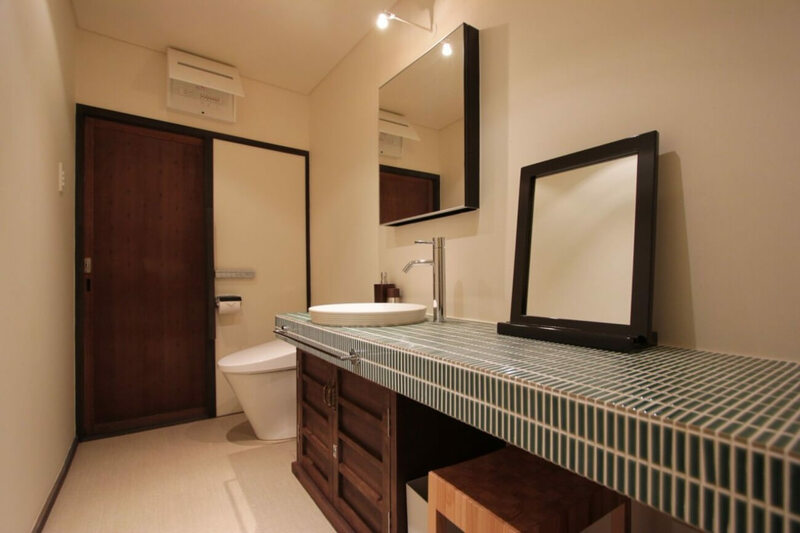 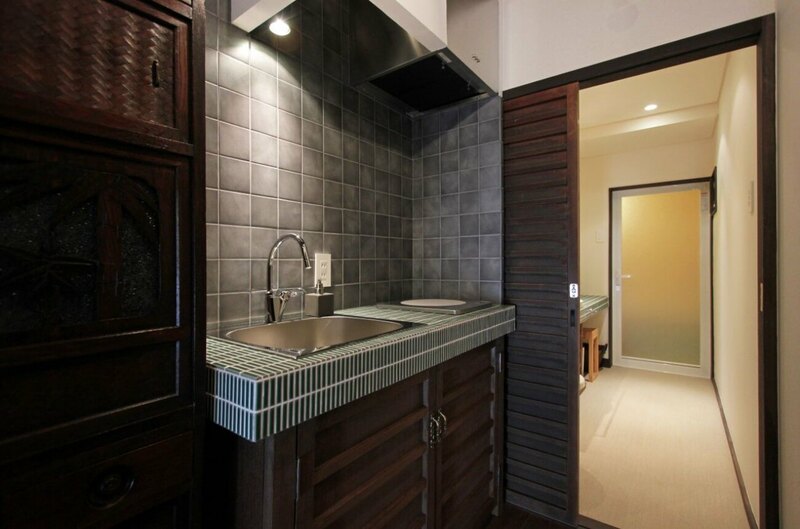 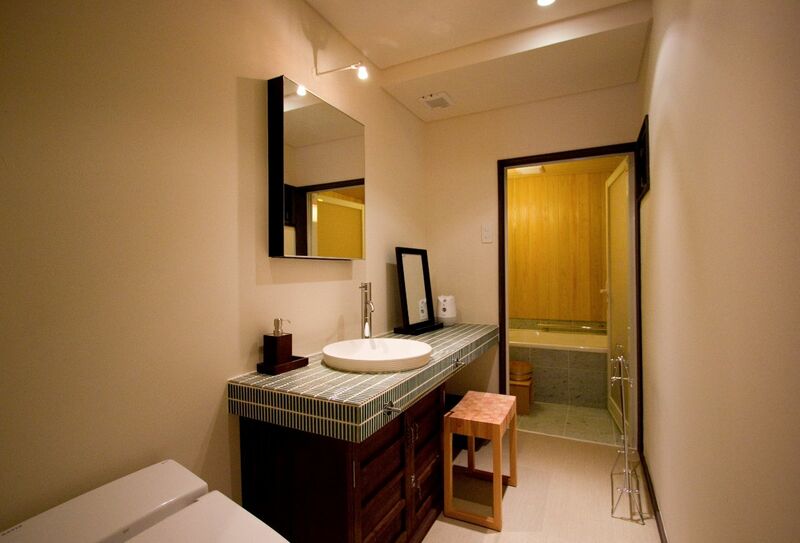 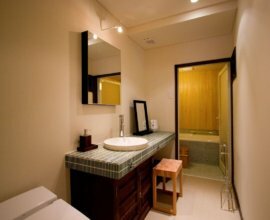 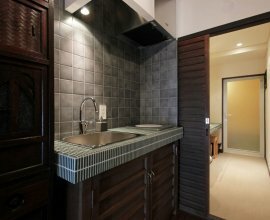 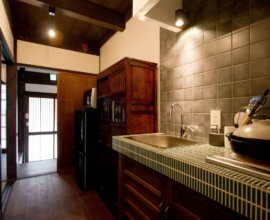 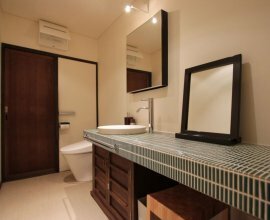 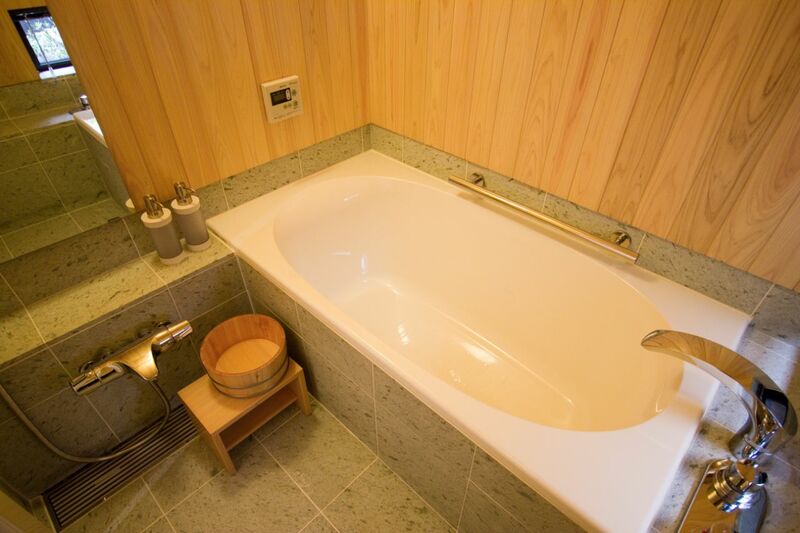 Centrally-located a 12-minute walk from Gion and a 7-minute walk to the Shijo-Kawaramachi shopping and dining district. 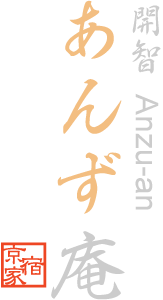 “Anzu-an” can be found between two main subway lines of Kyoto — the Karasuma Subway line, and the Keihan Line. 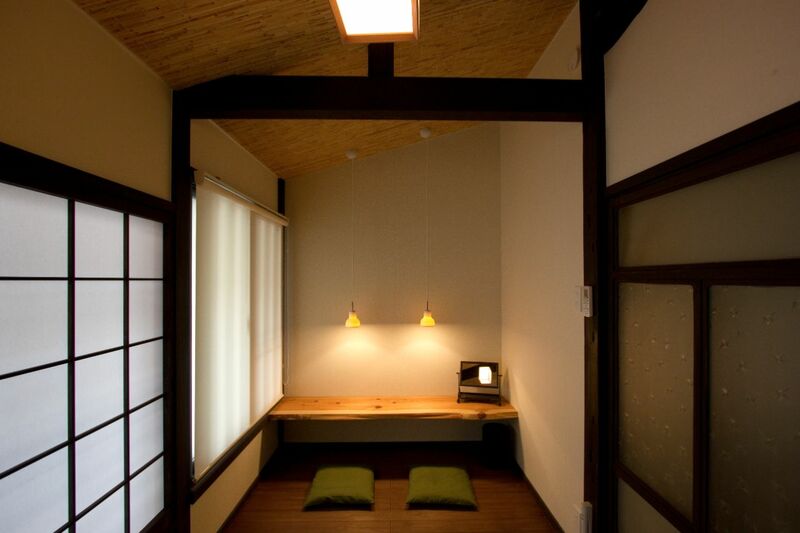 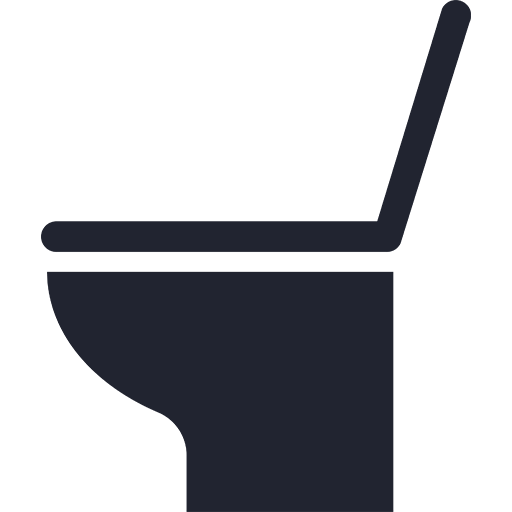 You will also be surrounded by a number of different bus stops. 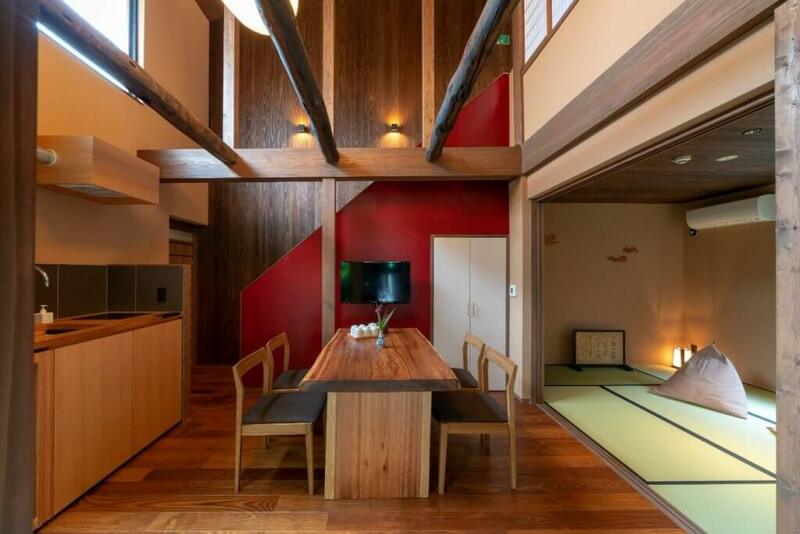 Grab the one-day Kyoto City bus pass to make the most of your stay in Kyoto. 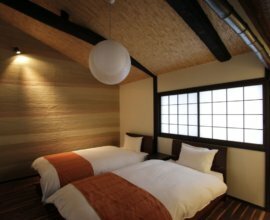 A short 5 minute walk north, towards the Shijo-Kawaramachi area, will lead you to the exciting shopping and dining district of Kyoto city. 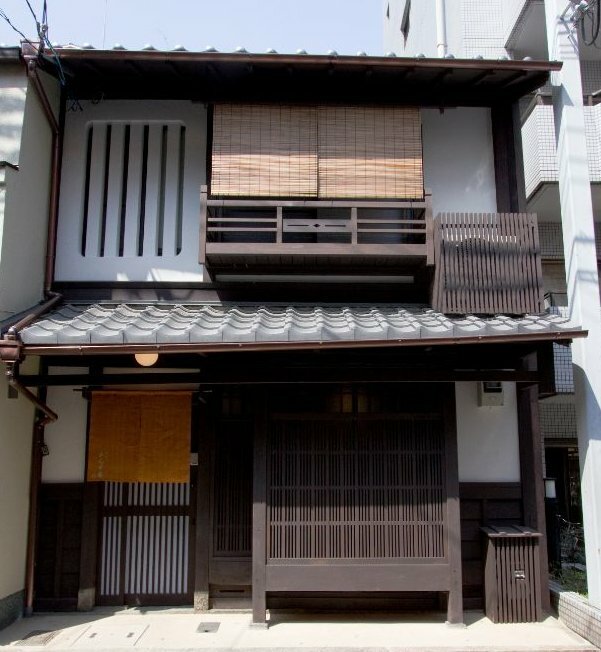 Cross the Kamogawa River to enjoy the traditional atmosphere of Gion, Kyoto's celebrated geiko district. 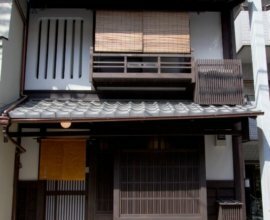 Here you will find preserved architecture, Yasaka Shrine, Kyoto sweets, and unique local souvenirs. 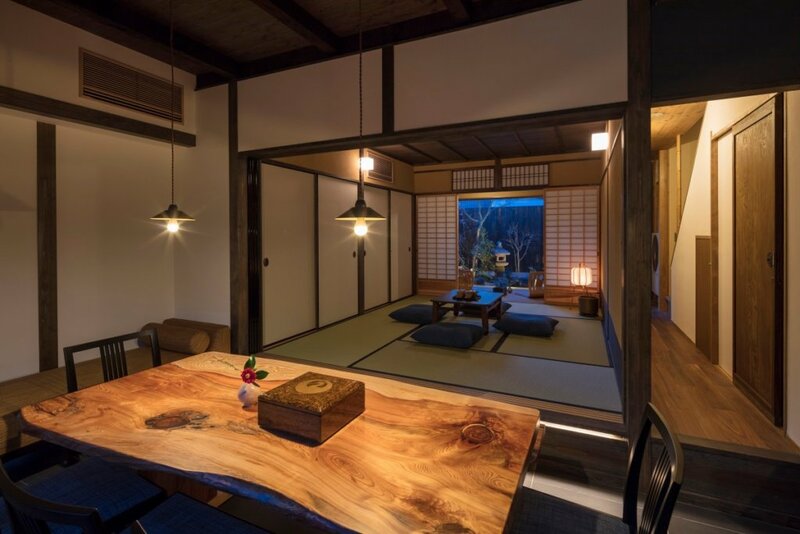 Along the way, you’ll see a many local restaurants serving quintessential Japanese dishes. 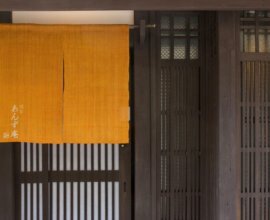 Sample Kyoto's world-famous “kaiseki” traditional course cuisine in the Pontocho dining alley, just a 9-minute walk away from home. 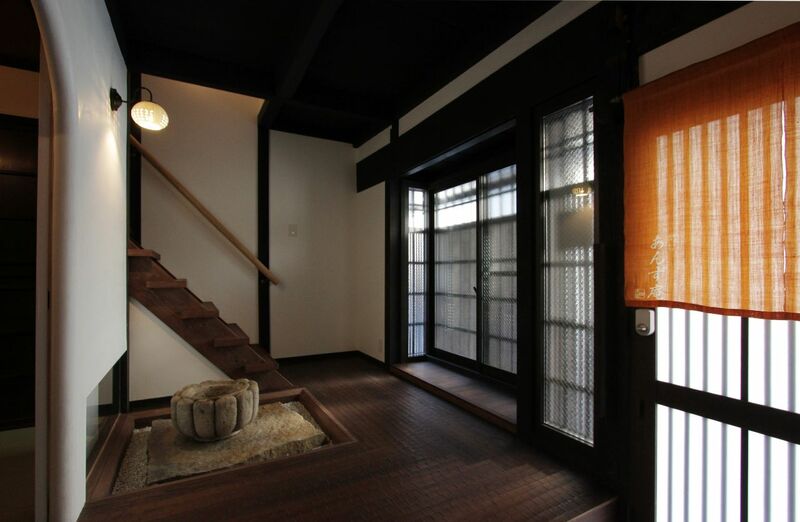 2) Take a short walk to "Karasuma" Station and transfer to the Hankyu Line. 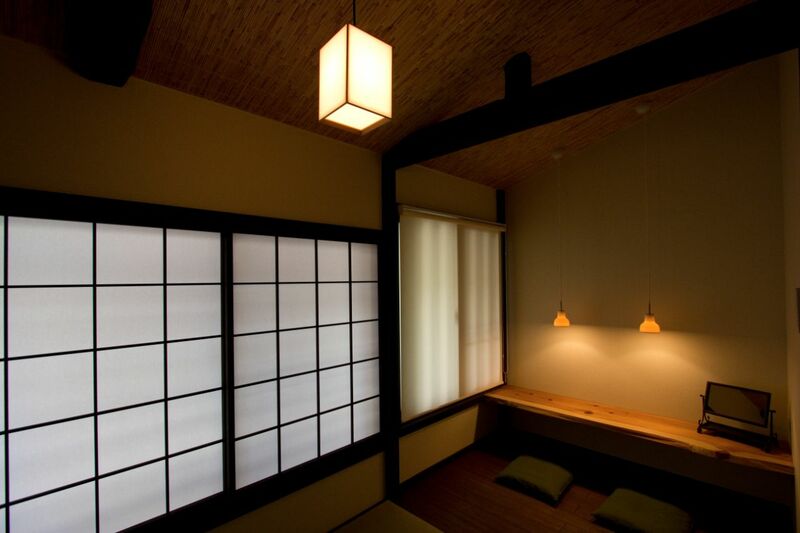 3) Get off at "Kawaramachi" Station.